We finally made it into Phuket; Au Chalong to be precise. This marks the end of our scientific endeavours as we cannot sample in economic zones. It's hard to believe that we made it all the way across the Indian Ocean and living as a land-lubber is staring us in the face. We thought very briefly about continuing on, but that we have much to do here and hitting the high seas again will have to wait until our 2014 Expedition. I had a haunting feeling during our crossing that the oceans were virtually empty, somehow--and incredibly--devoid of life. Sure we saw a pod of whales, two pods of dolphins, caught precious few fish and birds were few and far between, but the Indian Ocean is considered to be one of the worlds last untouched oceans. Still many many days passed where we saw absolutely no sign of life. Could it be that such a vast ocean supports so little life? And if so, what could we expect to see on the Pacific or the Atlantic... Anything at all? As we sailed through some of the most remote atolls in the Maldives, we saw water bottles floating around, flip-flops, household detergent bottles and diapers. The floating debris got worse as we approached Male, the main tourist hub of the Maldives. In Thailand, we saw black rubbish bags filled with trash floating on the sea. And single-use plastic bags were ubiquitous. It's tempting to think that whatever is happening to the worlds oceans does not affect life on land. But that is just not the case. 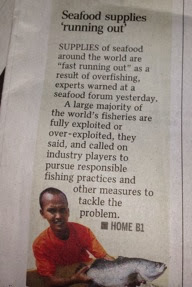 A recent article in the The Strait Times in Singapore reports what we all knew already: that the world's fisheries are collapsing as a result of over-fishing. The good news is that sustainable fishing practices are starting to emerge. The Marine Stewardship Council (MSC) along with the World Wife Fund for Nature (WWF) organised Singapore's first Sustainable Seafood Business Forum. The bad news is that fish from sustainable fisheries can cost anywhere from 20-40% more. There is plenty that we can all do, however. We can forego the use of single-use plastic bags and bring our own reusable bag when you we shopping. We can also change our buying habits by supporting sustainable fisheries. Little things like that multiplied across millions of people has a tremendous impact. we will be busy forming the Indigo Foundation that will fund our future expeditions and the development of the sampling kits that will be fitted to our world cruiser participants. Our work depends on the cooperation of our fellow cruisers. If you are interested in participating, please contact Rachelle Lauro on rachelle (at) indigoexpeditions.com to be added to our growing list. Final thoughts Is a very important of every part of life. when you want to take final thing you should to take help with some body.An creative writers can help for your final thoughts. View here https://silveressay.com/ lots of great tips on related topics. Congratulations on your success. It’s quite appreciable that in today’s world of uncertainties, you’re moving forward with some great initiatives and I wish you all the luck to proceed further. Here goes the blog that shows how to craft a good marketing essay by following a few simple proven tricks.